Please accept my warm welcome to the Ryukoku Museum homepage. Let me tell you a little about our museum and the city of Kyoto. The Ryukoku Museum aims to be a comprehensive Buddhist museum which examines the past, present, and future of Buddhist culture, mainly focusing on Buddhism in Japan and other Asian countries. Throughout the world, the place of religion is under consideration. More than a mere religious framework, Buddhism has long continued to enrich people's hearts through a wide range of means such as painting, sculpture, architecture, literature, culture, and customs. Along with the city of Nara, Kyoto has continued to flourish for well over a thousand years as a Japanese center of Buddhist culture. As a result, there are a large number of Buddhist temples and an abundance of cultural properties reflective of Buddhist culture. It is safe to say that these have become an integral part of the daily lives of the people. When you have the chance to visit Kyoto, your reminiscent feeling may be due to the accumulation of this long history. In addition, Kyoto enjoyed many long years as the country's capital city. While Kyoto is of course graced by an ancient and natural environment, it also has developed a rich cultural history. The Ryukoku Museum is located right in the center of this city, within walking distance from Kyoto Station and right in front of Nishi Hongwanji Temple, a designated World Heritage Site. The surrounding neighborhood includes a “monzen machi” (temple-front town), as well as the Kyoto Aquarium and Kyoto Railway Museum (scheduled to open in Spring 2016), which are newly-established cultural institutions. We hope that our museum will serve the ancient city of Kyoto as a "museum invigorated by the town". 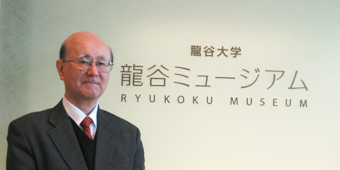 Since the Ryukoku Museum's opening in April, 2011, Professors Akira Miyaji and Takashi Irisawa, both specialists in Buddhist Art History and Buddhist Culture, have served as Director. I wish to set a new foot forward while learning from my predecessors' endeavors and experience. It is my earnest desire for the Ryukoku Museum to continue serving the public in a useful way by providing special exhibits in addition to our regular offerings. These efforts are even more possible through your gracious support and feedback. We eagerly await your visit to the Ryukoku Museum. © Ryukoku Museum. All Rights Reserved.